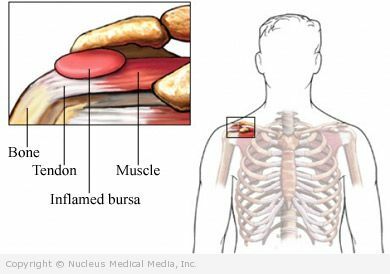 Bursitis is inflammation of a bursa. A bursa is a thin, slippery piece of tissue that protects tendons. Tendons are the tissues that connect muscles to bones. The bursa reduces friction between the tendon and bone. It allows the tendon to glide easily over the bone. Chronic bursitis is usually caused by long-term overuse. The repeated motion of a muscle-tendon unit causes friction in the bursa. As the activity continues, the bursa becomes inflamed. It may fill with fluid. The bursa thickens and does not function well. Both bursa and tendon may become irritated. The doctor will ask about your symptoms and your physical activities. The painful area will be examined. You may have an x-ray. Do not overdo sports and other activities. When doing a new activity, gradually increase the length of time you do it. Make sure you perform activities correctly. Wear protective pads if you play contact sports.